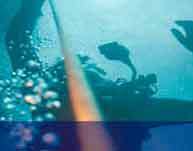 1 – What Kind of Diving Operations Can Seasub Perform ? 2 – What Are Seasub Main Operation in Ships ? 3 – How Can We Blank a Ships Aperture ? Seasub is a inshore diving company that provides diving services to a depth of 60M; normally our main operations are performed in ships to dephts of 18M ( on a large ship ).Seasub is specialized in underwater maintenance, repair and inspection of ships and afloat structures i.e. pontoons. There are many kind of operation that Seasub can provide to a shipowner; Underwater Propeller Polishing to 1 micron CLA finish, In Water Surveys, Afloat Repairs of cracks and corrosion holes ( permanent & provisional ),Hull Cleaning, Welding of Anodes, Cutting, small salvage operations. There are mainly two kind of natural apertures on a vessel: Intakes, to provide water suction for ballast or cooloing of engines and Outlets to provide a way out of water from the ship to deballast and to remove the hot water from any engine etc. Seasub can provide special made blanks that assure safety for intake or outlets no matter the size.